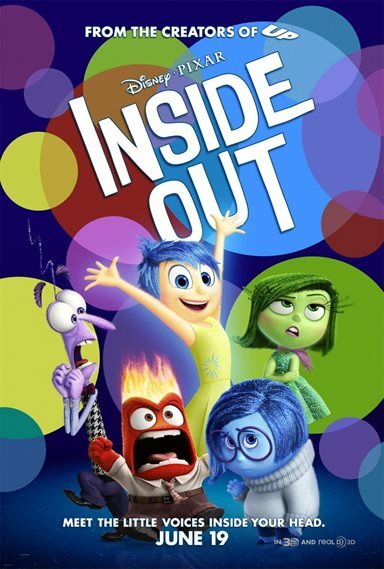 Download Inside Out in Digital HD from the iTunes store. Inside Out images are © Walt Disney Pictures. All Rights Reserved. The voices in your head are real! They are cute, colorful, and wreak havoc with your emotions. At least that is what Disney and Pixar would like you to believe. Riley is an 11 year old girl who, for the most part, has had a pretty happy life so far. She is a silly, sweet, honest kid with loving parents and good friends. All of this can be attributed to the "emotions" inside her head – Joy, Anger, Disgust, Fear and Sadness. These little creatures have been controlling Riley's feelings since birth and storing her memories in the different compartments of her brain. When Riley's family leaves their Midwest home for San Francisco, her world is sent into turmoil, along with her emotions. As Sadness takes over, Joy tries to make everything happy again but only manages to get them lost in the deep recesses of Riley's mind. While trying to get back to headquarters, Joy and sadness take an adventure through Riley's brain and memories while Fear, Anger and Disgust try to hold things together but manage to make a mess instead. Ultimately, Joy learns she can't keep Riley happy all the time and sometimes Sadness needs to be in control. Starring Amy Poehler (Parks and Recreation) as Joy, Phyllis Smith (The Office) as Sadness, Bill Haden (Saturday Night Live) as Fear, Lewis Black (Unaccompanied Minors) as Anger and Mindy Kaling (The Mindy Project) as Disgust, Inside Out is full of comedic talent that is evident throughout. Poehler is terrific as the always upbeat and happy emotion and Kaling and Hader do a great job. However, the standout performances for me were Black and Smith who portrayed their emotions fantastically and brought many of the laughs throughout the film. Smith especially makes Sadness mopey without being overly whiny. As an animated feature with bright colors and cute songs, you would think Inside Out is a great kids movie but not entirely so. While kids will enjoy it, the subtle undertones are a little more adult than your average Finding Nemo or Frozen. Many of the jokes would fall flat with younger audiences (as with many animated movies ( Aladdin, anyone?) and the death of a beloved childhood imaginary friend was truly a sad moment towards the end of the film. The array of colors pop off the screen - enhance by the 3-D technology which is utilized well in this feature. There is also a bonus short at the beginning that is a little depressing, but ends up with a happy ending, of course. It didn't live up to the "squirrel with the nut" Gone Nutty short leading off Ice Age and I wondered what was the point but kids will find it cute.